Tonight, I am going to conclude my series on the Benjamin Plateau. However, since there are so many other things that I could write about this area, I am sure that I will pick it up again in the near future. In earlier posts on this series, I have written about the plateau itself and the four cities that guard its passages, Gibeon, Gibeah, Geba and Mizpah. I encourage you to go back and read those. To bring it all together, I invite you to go and watch a video that was produced by Bill Schlegel and the folks associated with the Satellite Bible Atlas. The video covers the Benjamin Plateau and does a great job of graphically showing the many different aspects of this region in light of Scripture. This video is the fourth in a series of (currently) seven videos that accompany the Satellite Bible Atlas. Ironically, Todd Bolen posted some information about the Satellite Bible Atlas today. Do you know someone who is interested in Biblical geography? If so, I would recommend that you purchase this book for them. Along with it, you get digital copies of all of the maps and you have the option of also purchasing a wall map the land of Israel. It is well worth the money. Today, we are going to continue our series on the Benjamin Plateau. We have discussed three of the main cities that guard entrances to the plateau (Gibeon on the west, Gibeah to the south and Geba to the east). Today, we will take a look at Mizpah, which guards the plateau to the north. 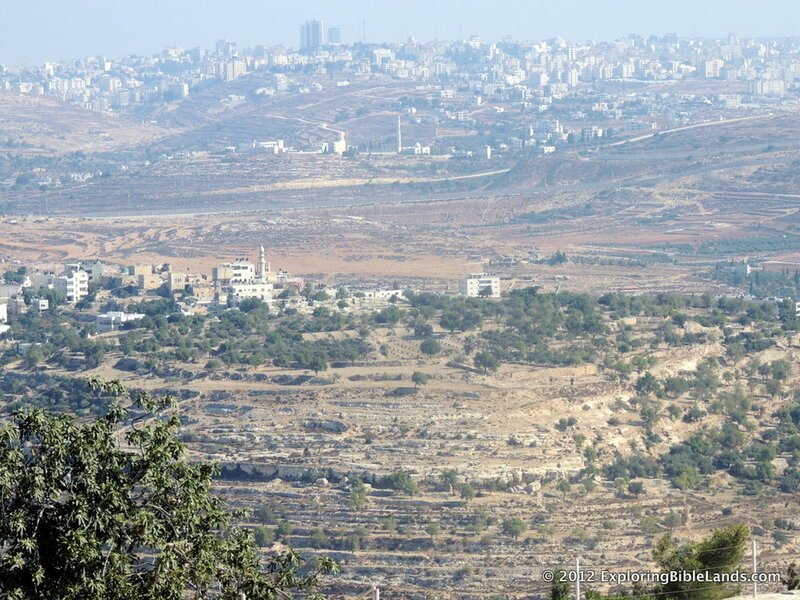 There are two different locations that are identified as Mizpah: Nebi Samwil and Tell en-Nasbeh. 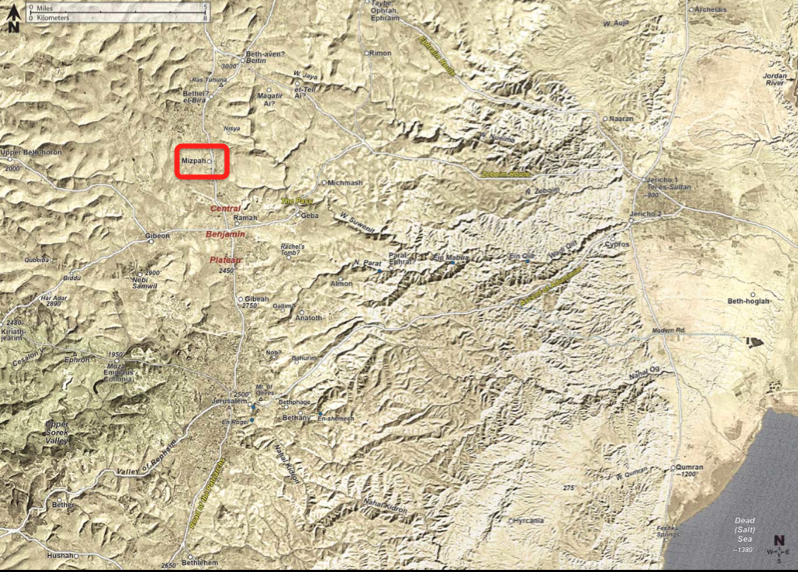 However, associating the site of Mizpah with Nebi Samwil is probably not correct. For a good analysis of this, I encourage you to read an article on Todd Bolen's blog from 2008. Tell en-Nasbeh is located about 8 miles north of Jerusalem along the "Road of the Patriarchs". It is in the central mountain ridge. Considerable Iron Age artifacts and construction have been found at the site. The city of Mizpah is typically identified with the prophet Samuel. It is at Mizpah that Samuel prayed for the children of Israel after they had been worshiping Baal. In some upcoming posts, we will discuss some more aspects of the Benjamin Plateau. (NOTE: This is the third in a series of posts about the Benjamin Plateau. There have been other posts about the plateau and the town of Gibeon.) Located just a few miles north of Jerusalem, the town of Gibeah guarded the southern end of the Benjamin Plateau. It is located about 2800 feet in elevation on the watershed ridge along the central mountain range. As a traveler going north along the "Way of the Patriarchs" out of Jerusalem, Gibeah would have been the first city that they would have come to. No doubt, many of the central figures of the Bible went through Gibeah. During the reign of King Saul (~1050BC-1010BC), he set up his capital in Gibeah. And, as we read the account of his reign in 1 Samuel, we can even read that it is referred to as "Gibeah of Saul". The location of Gibeah is known as Tell el-Ful. William F. Albright led a couple of excavations of this site in the 1920s. During his work, he found evidence of a rather large fortress, which dates back to the time of Saul. In modern times, Tell el-Ful is easy to recognize due to the large, partially built building on top. In the 1960s, King Hussein of Jordan began construction a palace in Tel el-Ful, but construction was halted when the Six-Day War broke out. Since Israel won the war, the palace was never finished and now all that remains is the skeleton of the building. The picture at the top of this post is of Tell el-Ful from the east. It was taken by Ferrell Jenkins in 2011. NOTE: If you are reading this post from an email, you might have to click on the title to view the post from a webpage to see the image.